- Coltan is a combination of columbo and tantalite. It is refined to tantalum, a substance with a high electrical charge. 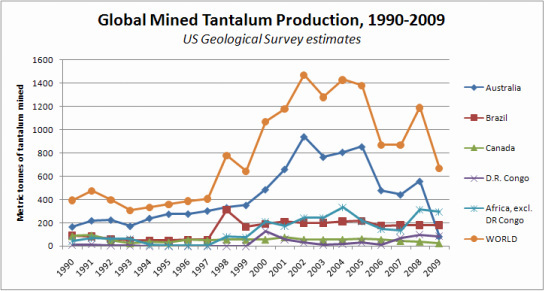 - The largest tantalum reserves are found in the Congo. Over 80% of the world's tantalum is found in Africa. - Miners are not paid fairly for their labor and are treated like slaves. - The borders of Africa have little meaning. These geographical areas do not take language, religion, or cultural backgrounds in to account at all. This is the case do to colonial countries which were formerly present in Africa such as England, France, and Belgium. - Because women lack essential human rights, African society can not function to the standards held in the Western world and other more developed countries.